(On Cable TV, July 2017) The original Bad Santa became a classic of the counter-sentimental Christmas subgenre, so any sequel would have big shoes to fill. 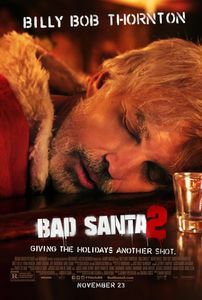 It may not be such a disappointment, therefore, if Bad Santa 2 is more ordinary than amazing. Sadly picking up a decade and a half later with the characters in just-as-bad shape, this sequel moves to Montréal Chicago for wintry theft. The highlight of the movie is probably the mother/son relationship between Billy Bob Thornton and the irreplaceable Kathy Bates, both of them delightfully scummy as lifelong bad influences. Tony Cox shows up again as a violent wildcard, while both Christina Hendricks and Jenny Zigrino show up as voluptuous eye candy. Alas, Brett Kelly also shows up as a grown-up creepy kid (still creepy), and his inclusion in the plot is more sad than hilarious or heartwarming. Bad Santa 2 works best as a foul-mouthed criminal caper procedural than a falsely cynical Christmas movie—it’s not quite able to re-create the original’s blend of world-weary sentimentality. But it does try, and it won’t be out of place when, in two or three years from now, it will tag along the original in a combined Blu-ray edition. Like most R-rated comedies, Bad Santa 2 pushes its jokes as far as it can go, and some of them definitely end up over the line of good taste—even for seasoned R-rated viewers. That’s another reason why even if the movie does scratch more or less the same itch as the original, it won’t qualify for essential viewing even for fans of the subgenre. Underneath the unrelenting stream of foul language, sexual references and overall bad behavior, it’s an average effort made with perfunctory skill. It works, and it will work if viewers are hungry for something like the original, but it’s not much more than that. (On Cable TV, November 2016) As I slowly digest the results of the 2016 American Presidential election (albeit not without a few gastric refluxes along the way), I thought that a fictional take on the 1992 Clinton campaign would soothe my nerves. 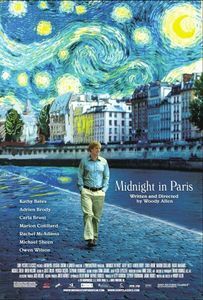 Alas, no such luck: After the sheer weirdness of 2016, Primary Colors seems positively sedate even in its stew of political corruption, adultery, dirty tricks and dark secrets. People in 1998 still obviously cared about moral flaws, which is more than seems to be the case in these dark days of November 2016. 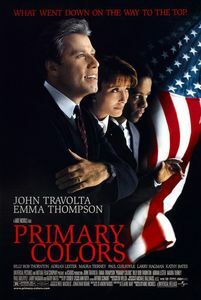 Adapted from a roman à clé penned as “Anonymous” by political journalist Joe Klein, Primary Colors purports to talk about the Clinton campaign, albeit with many details scrubbed and others pushed well past the point of fiction. John Travolta shows up with a full-on Bill Clinton impersonation, even though there isn’t as clear a Hillary analogue in Emma Thompson’s character. The protagonist of the story is a young political operative who (as with seemingly every political operative drama since, from The Ides of March to Knife Fight to Our Brand is Crisis) has a crisis of conscience after discovering his candidate’s darkest secret. It’s handled decently enough, with twists and turns that justify the fiction moniker. Characters and actors of note are Kathy Bates as an unexpectedly idealistic battle-axe, Larry Hagman as a veteran politician, Billy Bob Thornton as a redneck strategist (compare his character with the one he plays in Our Brand is Crisis) and Adrian Lester as the overshadowed protagonist … among many other notable names in smaller performances. As a fictionalized look in the primary campaign process, Primary Colors is not bad—and even after nearly twenty years remains just as interesting. But it may not be as effective right now, as I look at the headlines and wonder when we veered off in this absurd alternate reality. Hopefully it’ll look a bit wilder in four years. 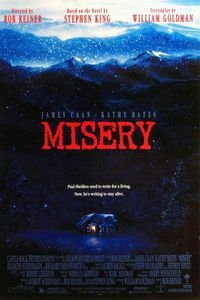 (In French, On TV, July 2016) Stephen King’s Misery is a memorable novel (even and especially now, touching upon the themes of fannish entitlement that have grown so tediously familiar latterly), and its movie adaptation (partially thanks to screenwriter William Goldman) manages to be as good, in its own way, as the original book. James Caan ably plays a best-selling author who, thanks to an accident, comes to rest in an isolated farmhouse under the supervision of his self-professed “number one fan” (a terrifying Kathy Bates in a career-best performance) who turns out to be completely crazy in dangerous ways. What follows is so slickly done as to transform King’s writer-centric thriller into a horrifying experience for everyone. Director Rob Reiner is able to leave his comedic background behind in order to deliver a slick thrill ride, gradually closing off the protagonist’s options even as it becomes clear that he’s up against a formidable opponent. While the film does soften a few of the book’s most disturbing or gory moments, it does not lack for its own unbearable scenes. A solid, competent thriller, Misery easily ranks near the top of King’s numerous adaptations, and remains just as good today as it was a quarter of a century ago.